Getting your body moving first thing in the morning will spark your brain power, invigorate your body, and is a great starting point for a positive and healthy day. Let’s jump right in. Here are five compound exercises (an exercise that combines more than one muscle group for maximum time management) to jump start your day. A huge benefit of your Total Gym is the ability to work multiple muscle groups at the same time. This not only saves time but it also challenges your coordination, balance, and proprioception (the awareness of your body in space). This dynamic routine will take you about five minutes and will make your body, mind and spirit feel great for whatever your busy day has in store for you. Since most of us are visual people, and these are all dynamic, compound exercises, check out the accompanying video for detailed explanation and to watch proper execution of each exercise. 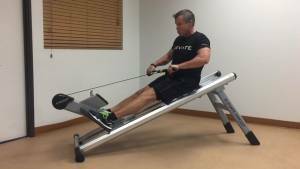 I also give several modifications to make each exercise easier or more challenging to accommodate your fitness level. Down Dog to Plank to Push-up, GlideBoard Slide, and back to Down Dog. This is a super way to wake up your body and there are a plethora of benefits: The Down Dog gives your hamstrings a great stretch. The Plank challenges and strengthens your entire core, and fires and strengthens your chest, shoulders, and triceps. The Glideboard Slide increases your core engagement and requires the back muscles to stabilize your torso. Perform 2 reps of this exercise. 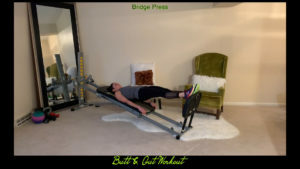 This staple Pilates warm-up exercise strengthens your hamstrings, gluteals and lower back but most importantly, it articulates your spine to keep it supple and healthy. Perform 3 reps of this exercise. Strengthens your back “lat” muscles, triceps, your six-pack muscles and your lower abs if you do the advanced option. Perform 5 reps of this exercise. Pumps your lats as well as your upper back/rear shoulders and lower back muscles which are so important for good posture. Perform 5 reps of this exercise. Trains your lats and lower back muscles and targets your biceps to get those “guns” looking good for the day. Perform 5 reps of this exercise. The recommended reps are to keep your routine at around five minutes. You can always do more if you have the time or you’re just “feeling it” on a strong day. Since you’re not completely taxing the muscles and taking them to full fatigue, you could do this workout daily if you wanted, and I hope you do! This simple routine will make your body smile and help you start your day in a great mood. Add some gratitude for having a healthy body (and a Total Gym!) and you’ll be off and running for a happy, successful day.